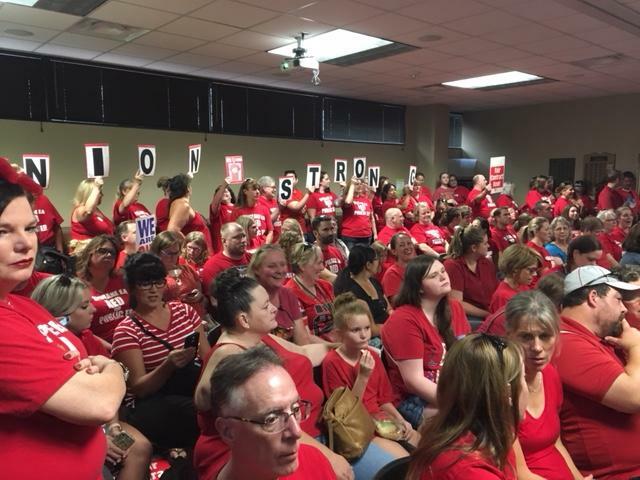 As hundreds of their colleagues cheered outside, teachers and support staff urged the school board during its weekly meeting to commit nearly $28 million in pay increases from funds provided by the recently finalized McCleary decision. “It’s time for Spokane Public Schools to live up to the McCleary promise,” said Katy Henry, president of the Spokane Education Association, which represents teachers and support staff. However, several districts, including Spokane, contend that state law limits salary increases to 3.1 percent for the 2018-19 school year. “This is an extremely complex discussion about the legal interpretation of the McCleary decision,” said Brian Coddington, the district’s director of communications and community relations. Teachers want the entire $27.7 million allocated toward salaries. Henry said the district was employing an “outdated legal argument” in holding to the 3.1 percent increase. Henry also asked the board to “provide the parameters” for its bargaining team to renew contract talks. Support staff also urged the board to allocate more funds toward salary hikes. Last year, a first-year teacher in Spokane Public Schools earned $36,521 annually. For a teacher with a master’s degree and 10 years’ experience, that rose to $52,263. For secretarial-clerical workers in Spokane Public Schools, the first-year salary was $15.05 per hour. After five years, that increases to $19.23 an hour. All five SEA speakers finished to loud applause despite an earlier admonition from board president Susan Chapin. Because the contract talks were not on the Wednesday agenda, board members and Superintendent Shelley Redinger were not allowed to engage with the SEA speakers. The SEA, which has a bargaining team of 28, represents about 3,400 employees. Spokane teachers aren’t alone in seeking salary increases. Talks are ongoing at Central Valley, Mead, East Valley, Cheney and other districts in the county and state. Published: Aug. 22, 2018, 9:52 p.m. Updated: Aug. 22, 2018, 11:02 p.m.